Two souls and one great vision! 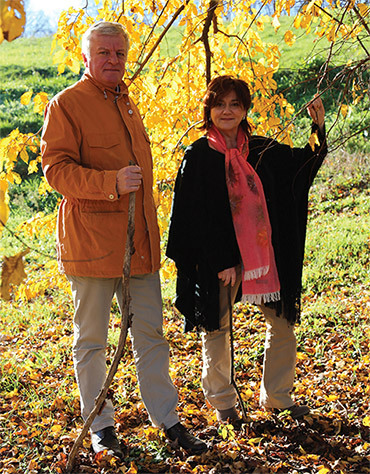 The vision of Italian entrepreneur Massimo Azzolini, who, with a wealth of experience in the field of organic farming, in 2002 went to Bulgaria and discovered the hidden side of the land of Chernogorovo. A strip of raw nature, rugged but rich in beauty and potential, attracted Massimo’s curiosity, prompting him to redefine the contours of a landscape that was fading away. A curiosity that quickly turned into an ambitious project. A project that is now coming to fruition, bringing to life the twin souls of a place as an expression of creativity and excellence. “I felt so irresistibly drawn to that strip of hills, to a place that was so archaic and wild, so harsh but at the same time so authentic in its simplicity that my mind began to sail in that generous and uncontaminated nature. I could see myself in a landscape that then, with the passage of time and crowned by the presence of storks, became increasingly real and alive. A place that each time rekindles in my heart a passion for the land that I share with my family and with all the people who join together to build dreams that come true”. Neragora’s responsibility towards the local territory means investment and hard work. Passion alone is not enough to make the most of the area and ensure it wins its due acknowledgment. Passion alone is not enough to make such a complex and authentic product as organic wine. It requires effort, preparation, enterprise culture, time and human capital. The Azzolini family decided to bring in some of Italy’s top specialists – oenologists and agronomists of international renown in the field of organic agriculture. The goal was clear – to make wines of excellence in Chernogorovo. A team of young Bulgarian winemakers worked hand in hand with the Italian specialists right from the earliest stages.